Nelkin Designs Blog: New Year's Resolution ACHIEVED!!! I made a few New Year's resolutions last year, some of them I am still working on, but one I managed to achieve just in the nick of time! 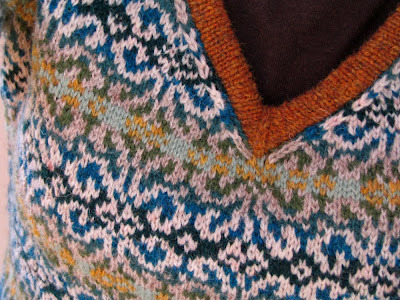 I promised myself I would finish Venezia (started it in 2007) AND make another sweater for myself. I live in chilly Upstate NY and it's downright embarrassing that I end up wearing fleece instead of wool 'cause I don't have enough sweaters! Not one, but TWO sweaters finished! Can I get a Hoot Hoot (pardon the pun!) 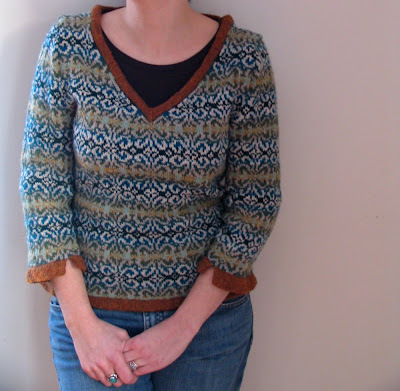 One is Venezia by Eunny Jang from Interweave Fall 2006 and the other is Owls by Kate Davies. 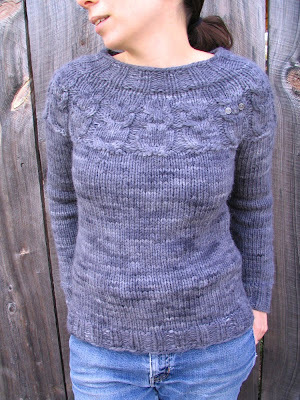 I ended up using Schaefer Yarn's Esperanza for Owls and have rekindled a love affair I thought I was "over". This yarn is scrumptious. It's got structure and loft at the same time, a combination that is excellent for Owls. 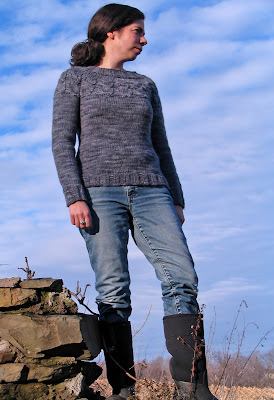 AND it only took me 18 oz to make the sweater, you gotta love that! You can see my Ravelry pages for more details, but know that I LOVE both these sweaters immensely and it's going to be a struggle to decide which one to wear tomorrow when I wake up. Feeling Accomplished and Happy and Ready for the New Year.... I hope you all had a lovely holiday season and are as ready to embrace this New Year with Strength, Creativity, Humor, and Peace as I am! 2?? you got 2 sweaters done? You so totally rock! Love the Venezia! Considered knitting it myself but I doubt I have the staying power to finish it - congratulations! amazing. they are both beautiful. i love the owls-looks beautiful on you too.